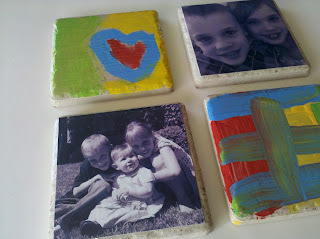 I love this fab and easy gift idea! Not to mention affordable. 1. Cut scrapbook paper to fit each tile. 2. Spread Modge over each tile and place paper over it. Let it dry. You can also use a picture instead of scrapbook paper. 3.Brush Modge over the paper that has been glued and let it dry. 4. Glue felt pieces to bottom or use felt dots. 5. Once it's completely dry spray with clear coating.